Sydda Essop studied at the Michaelis School of Fine Art at the University of Cape Town. During the 1980s, she became an active member of Vakalisa, a community arts collective in the Western Cape. 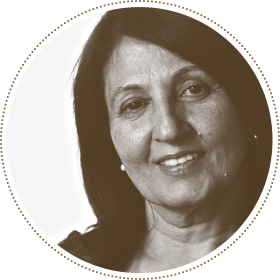 She also served as secretary of Wynberg Crisis, an organisation founded to assist and support parents whose children were charged with public violence during the State of Emergency in South Africa. In 1989, she contributed to an anthology of poetry, I Qabane Labantu: Poetry In The Emergency, compiled and edited by Hein Willemse and Ampie Coetzee. In 2003 Sydda founded The Karoo Gender Forum in the Central Karoo region to empower women and young girls, in collaboration with the Department of Social Development. In 2010 she contributed to another anthology of poetry, Nuwe Stemme 4, compiled and edited by Ronel de Goede and Danie Marais. 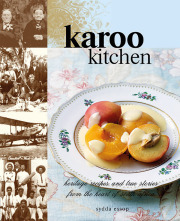 Sydda’s journey as a collector of recipes and stories about the unique and varied culinary traditions of the Karoo served as fertile inspiration for her work on the cookbook Karoo Kitchen. She lives in Beaufort West, where she continues her work as gender activist.